S: So my idea is to continue to exchange students between Japan and America and if possible to study Chinese or southern ? [maybe Southeast Asian Buddhism-dc] or India. To learn the Indian Buddhist way if possible to have some more good teachers. S: Yes, if possible. I found Govinda. ... I cannot agree, but I liked his attitude. Richard Baker from a KQED interview: Govinda, in his autobiography, says that he had to choose between the inner world and the outer world. LP: When Lama Govinda came with his wife, Li Gotami, they had a little art show downstairs in the dinning room and she showed her paintings and I went with Suzuki Roshi to meet Lama Govinda in the first stone room and they greeted each other and sat down together and Suzuki Roshi formally asked Lama Govinda, "Could you please tell me what is the cause of suffering?" And I don't remember what the answer was. DC - You've read The Way of the White Clouds by Lama Govinda? In it he describes him and Li being in the most extreme cold winters where they'd boil water to wash their faces in and when they put their hands in it it already had ice on it and there was so much snow. He came to Tassajara in December and he said it was the coldest and most uncomfortable place he'd ever been. And it was only twenty or so - cold for Tassajara but not for Tibet and it was wet. And I remember that he and his wife ate in the zendo and she's from India and we had to put Tabasco sauce on her trey so she could cover all her food with it. And he gave a talk. Bob Halpern used to call him Mr. Govinda after Bob studied with Trungpa. Two months later someone from the zendo called me up and said, "I have this Tibetan monk here. This nice Tibetan monk’s coming over, so why don’t you come over and meet him." So I did. And it was the same Rimpoche. We smiled and nodded and he said he was going to India. I said, "Me, too. Can I visit you?" He said, "I’ll be in Kampong above Darjeeling." I wasn’t planning to go to India, I was just being sneaky. So I went. Les Hixon and his wife helped him buy 600 acres in the Catskills near Livingston Manor next to Daibosatsu adjoining it. Earlier, in 1976, Edo got Kapleau there and others from Japan. There was this big dedication of the Daibosatsu. So Sheila Hixon and I went to India and spent 10 days with this Rinpoche. He gave no directions, but he seemed like Suzuki Roshi – trying to figure out what to do. A woman named Gail Wearson who helped him came to America and said, "You have to ask him to take refuge." I went to him and asked him, "What does that mean?" And he said, "You can leave me but I can’t leave you." His name is Domo Geshe Rinpoche. He was Lama Govinda’s teacher in a prior incarnation in The Way of the White Clouds. He was 35. That was 1976. He’s 60 now. One of the other gifts I received during my time at Tassajara was the opportunity to make the acquaintance of a wise old man. When Lama Govinda arrived for a visit, I had no doubt that he personified wisdom and compassion; he had the regal quality of someone who had attained those human virtues and carried them gracefully. When he stepped out of the car, he put on his maroon mitred Lama's hat. He wore a matching long maroon robe. His white beard gently fell to the top of his chest. His face was lined with the deep marks of age. His eyes bestowed a depth I had never seen in a human being. In them were the worlds I longed for and identified with. In them were his travels to Tibet, his training as a Lama, his research as a scholar, his isolated hours as a writer. I was lucky enough to be chosen to attend him and his wife during their stay. Through Lama Govinda, Suzuki Roshi, and the other teachers who came to stay at Tassajara, I realized that wisdom and compassion could be manifest in the world today, in this technological wasteland where people hardly meet, much less commune with each other. I no longer tried to think of questions to ask my teachers to show I was not crazy or to demonstrate how smart I was. I knew that my task now was to sit, to focus, and to do my work, and I could trust my own inner process to enlighten me. 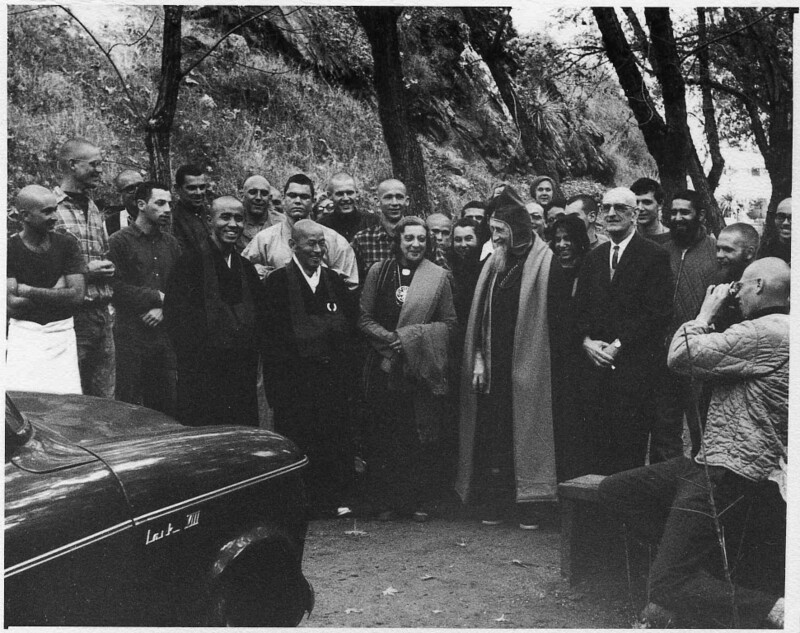 Li Gotami and Anagarika Govinda with Shunryu Suzuki and others at Tassajara, For all names see SR0019 in SFZC photo archive. Photos with Anagarika Govinda and Li Gotami from the Shunryu Suzuki Photo Archive on shunryusuzuki.com.